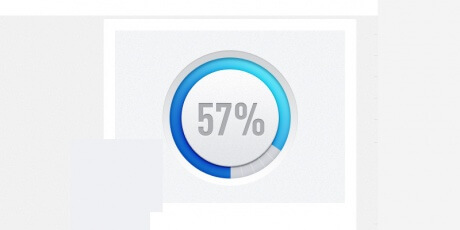 Use these PSD progress bars to represent a loading process dynamically. No visitor likes to wait, but even less when they don't even know for how long. A cool color volume knob including color coding to signal the progress. 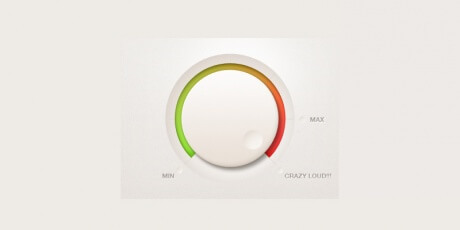 It includes captions to signify the volume levels, going from minimum to maximum to crazy loud!!! (no joke there). If you'd like to modify any aspect of this resource, creator Tommy King has provided the PSD file. A lovely set of UI controls including four elements: A volume knob and three sliders, two vertical (with different sizes) and one horizontal. They feature an attractive blue to green color coding to signal the selections. The original PSD is also included. Created by user Dart 117. A cool element to mark progress in a different way, avoiding the classic circles. This time, the element is a purple hexagon that gets filled with a soft orange color as the loading process is completed. 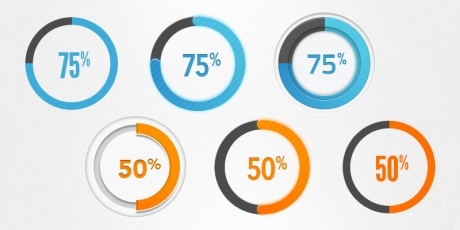 The percentage is also given in the center of the design. PSD provided by UIDynamics. Here’s one little kit that is light, clean, simple and colorful. 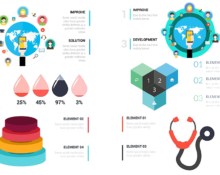 It is a nice set of user interface design elements, including a knob for volume, previous and next buttons, a search input field, different states for buttons, a colorful slider, a drop-down menu with icons and labels for messages, comments, friends, photos and settings. The file also includes toggles with lighting, and variations of radio buttons. The file is free and easily editable in Photoshop. This freebie provides a delightful progress bar, styled in pink and purple tones with a candy bar pattern. A nice cloud with a shadow posed on top of the design while some text below signals the exact percentage with a number. This resource is courtesy of 365PSD. 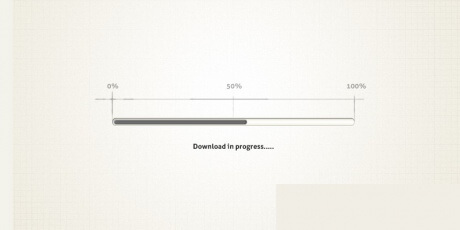 An elegant progress bar with a rather technical style. A gray bar moves as the loading process unfolds, contained within a few lines that lead to a trio of number signifying the start, middle and end of the progress bar. A text below reads "download in progress". Grab the PSD to perform any desired modifications. 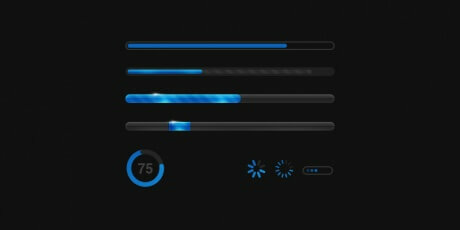 A fantastic set of eight blue loading elements with interesting lighting details. There are three different styles: Bars, circles and small spinners. The PSD has been provided by the guys at 365PSD in case you'd like to make any modifications. 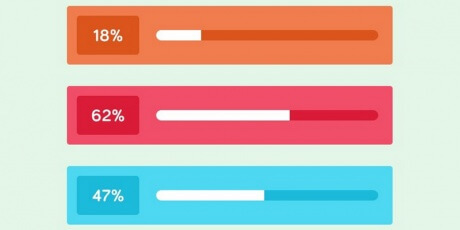 A fancy collection of progress bars originated in Photoshop with vector shapes. They feature soft colors, using a green and yellow color palette. The nine alternatives let you choose between three horizontal bars and six circular designs. Resource provided by PSD Blast. 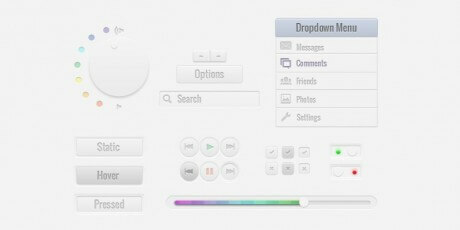 A very colorful set of UI elements brought to us by Dribbble user Mark. The items come in both dark and light alternatives, offering circular and horizontal loading bars, toggle buttons, buttons with icons and more. You can download the PSD for both color choices for free. This freebie lets you download an attractive circular progress bar with multiple touches in its design. First, as the bar fills with progress, a nice purple to orange gradient shows itself. 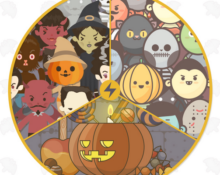 Moreover, the inner part of the circle displays the loading percentage with a number, right on top of a candy bar-like background. Jesse Spencer shares this project in which he experiments with different designs for circular progress indicators. There are four different alternatives, styled in both blue and orange colors, for a total of eight possible choices. This resource is available for free. A glamorous progress bar styled with bright shining effects and a strong green color. The loading process is signaled with numbers at the 0, 50 and 100 per cent lines. A sober black background can be seen around the design. The original PSD is available in order to make changes. 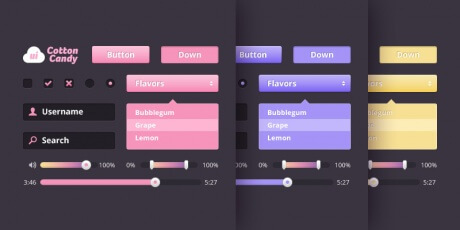 The Cotton Candy set is a cute UI elements mini set containing standard buttons (regular and down versions), radio buttons, checkboxes, input fields for username and search, dropdown with tooltip, sliders for volume and media player, and a range slider. It comes in three colors so you choose the one that suits your next project the most. The PSD comes in a ZIP file and it’s free and totally editable. 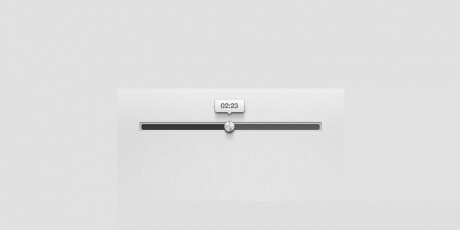 A soft Dribbble shot created by Aleks Faure providing a soft loading indicator. The design consists of a delicate circular bar that comes in two colors: Red and blue. The inner side of the circles shows a number with a percentage, keeping the subtle look that characterizes these elements. If your website requires users to upload content, this design could make the experience very enjoyable for them. 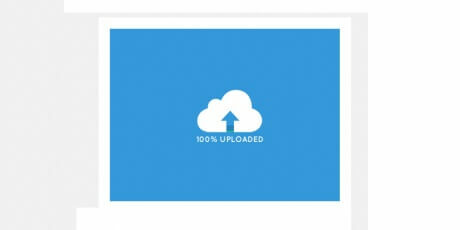 This design displays a cloud, with an arrow appearing as the upload finishes. When the file completes loading, the arrow shows completely and a text reading "100% uploaded" comes on the screen. A super creative design that allows you to represent loading processes in your website through a smooth wave animation. The idea is to show a black circle with a blue, wavy element filling the space. The animation is very attractive, making the element look like poured water. Created by Justin Nurse. 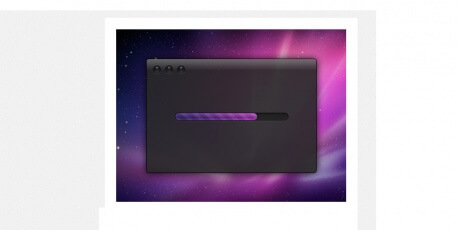 Alex from Dribbble has based himself in another shot to create this neat progress indicator. The end of the process is signaled in green, along with a checkmark icon, plus a verification text. A beautiful blurred background decorates the back of the design, which mixes well with the transparency on the widget. 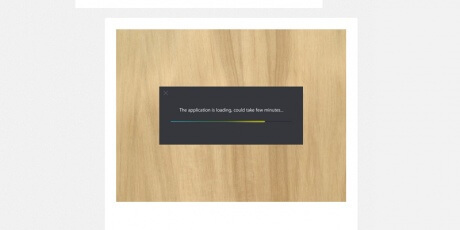 An appealing loading bar in Metro style featuring a multicolor gradient including blue, green and yellow. The bar itself is a delicacy, with a thin and subtle shape. A text above the bar tells the user to wait while the progress completes. Grab the PSD for this resource, for free. A beautiful design from Marco Moreno, offering a circular progress bar. 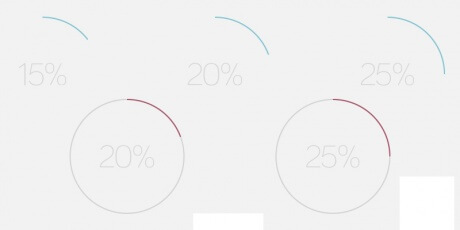 Inside the circle, a number displays the current percentage, styled with neat shadow effects. The bar going around the creation features a showy gradient, going from light blue to pink. 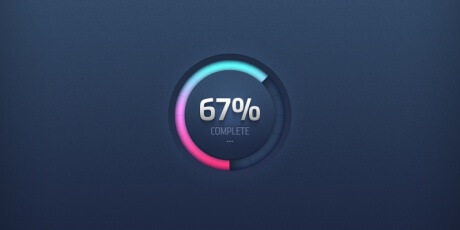 A gorgeous progress bar designed entirely with shapes and layer styles. It is contained within a sober, black window and features a bright purple design with a subtle candy bar detail. Moreover, a gradient makes the bar go from dark to light. 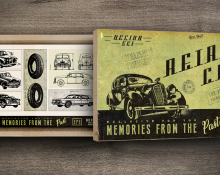 Created by Dribbble user Jeff Broderick. 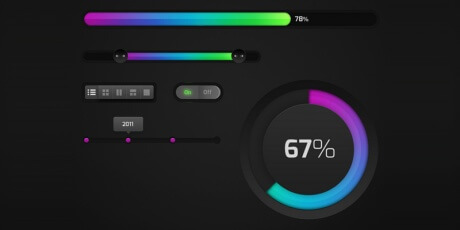 Dribbble designer Jeremy Sallée was inspired by another user and created this simple progress bar, including soft shadow effects and a black and white color palette. A small circular element signals the status of the bar while a tooltip displays additional information on top of it. A beautiful design that provides a circular widget intended to display the progress of a given process (upload, download, time, etc.). 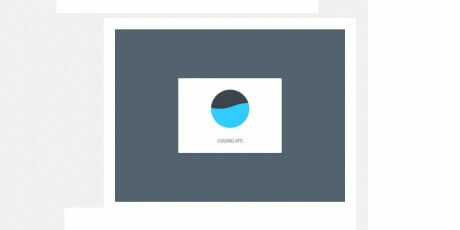 A light to dark blue gradient bar moves around the circle as the loading process finishes. You can grab the PSD file to make any adjustments. 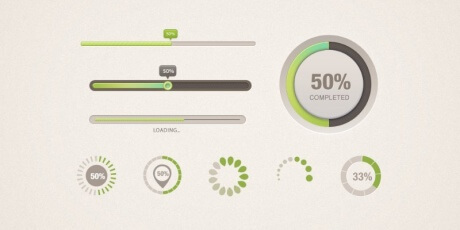 A nice set of flat-styled progress bars created by Miguel Mendes. They come in three different colors: Blue, red and orange. On the left side, a number displays the percentage while next to it you see a bar being filled, representing the same information.